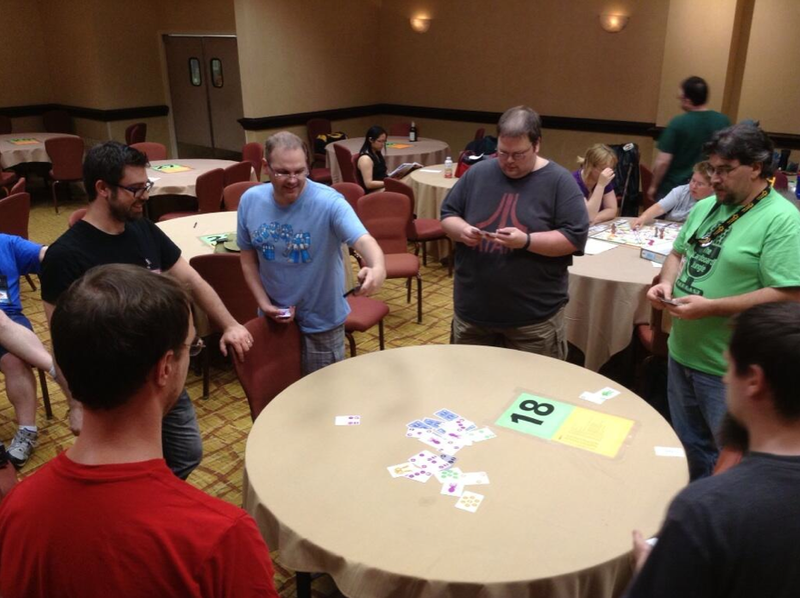 As we continued playing games at DexCon last weekend, I ended up playing/hosting a few of my own. I brought Pixel Lincoln, Maximum Throwdown, and a handful of prototypes. Pretty much everything made it to the table, which is opposite of most conventions where my games never leave my bag. I will haul them around all day, but never get a chance to play. At DexCon, we played them all and more. I had the retail version of Pixel Lincoln on hand, and some people had asked to play in advance. The game is just making it out to Kickstarter backers now and should be in stores soon, so it's still tough to get your hands on it. I ran a 4 player game at the request of designer Gil Hova. As soon as we started setting it up, Herb(Game And A Curry)'s eyes lit up. We had 2 players and room for 2 more. Dan and Adam from Perpetual Geek had played a preview copy, but never the final version, so they jumped in as well. Pixel Lincoln is a deckbuilding game that emulates classic side scrolling video games. Each player takes their turn working their way through the levels, buying items and defeating enemies, and eventually the player with the highest score wins. The game is also customizable in that it comes with twice as many cards as you need to play, so you can set your levels up with whichever enemies and items you want. I set up a medium level game because we had two first timers and it went well. I wound up talking to Herb for a while afterwards and he was really excited about the game, even after coming in last (or possibly second to last) place with just 21 points. The winner, Gil, had closer to 60. I was happy to get a game of Pixel Lincoln in, especially as the game is starting to work it's way out. Even just holding the box I get tons of questions about it, so it's always a blast to have it on hand at a convention. Maximum Throwdown is my card-throwing battle royal game coming next month from AEG. You choose one of the characters (Alien from Smash Up, Werewolf from Nightfall, etc) and take their deck. Then, players will each throw their cards onto the table trying to cover up their opponents cards. When a players turn comes around, he checks to see which icons are still uncovered and gets bonuses (draw more cards, throw more, points, attacks, etc). You play standing up, preferably at a round table in dead center of the convention room. This will usually gather the biggest crowd, and it really did at DexCon. Halfway through the first 6 player game, another set of players were all standing there waiting for the next game. We played 2 rounds before heading to dinner. I'm guessing everyone had a great time because there pictures all over twitter as this was happening. I can't wait until the game releases at Gen Con next month. We played Kingship a little earlier in the day, but I wanted to lump it in with my games. I had a role in the design and development, but Kevin Kulp will joke that I will either confirm or deny that during play tests, depending on how well it's going. The game was created at the 2013 Global Game Jam by Kevin Kulp, Major Johnson, Bri Lance, Louis Tomasello and myself. I was in and out during the Game Jam, but I've helped Kevin out a lot since and the game is really coming together. In Kingship, the King is dying. One of his sons will take his position, but we don't know which one. Each player is a Duke secretly pushing for one of two specific princes (as shown on your secret starting cards). You push your prince by voting on cards as they come up, buying land and influencing events. The game plays in about an hour and I would say it's pretty unique. Our 4 player game included myself, Kevin, John Moller and Anthony Racano. I wound up winning, but it was pretty close match. I've play tested it in about 5 different versions now and each has been better than the last. The plan is to get a solid prototype to Gen Con and get some games in, and see what the next step is from there. Ok enough about my games! Next up, we'll talk about selling weapons and selling your soul (sort of). Stay tuned!